This quick Guide is intended to help both new and experienced users of Symphony Pro create a new project, select the tools desired to work with greatest efficiency, and find links to the Help files for answers to questions which may develop while working with combinations of both new and ongoing tools. • When you see FMI (for more Information): follow the link to Symphony Pro Help Files. After selecting the (+) sign to begin a new project, the Quick Start Options window will appear. Fill in your Title, Subtitle (if any), Composer, Key signature, Time Signature (+pickup). And, from the Edit Instruments selection, create the instrumental setup you wish to use. While remaining in this window, make sure to select the Score View Mode which best suits your iPad Screen*. All of the Quick Start Options can be accessed at any time from within the score. The two top icons in the Navigation Menu will include all of the Quick Start Options as well as many more. The top icon is the Instruments Menu. The second contains the Score Menu with all Signature and Setup details. Note: When you are unsure about the meaning of a particular Icon or button, go to Help ( ) and select Quick Help. A map of the Score Window will be found with definitions of the Icons and Menus surrounding the page. When you open a new project and leave the Quick Start Options untouched, Symphony Pro creates a default page with a key signature of C major, time signature of 4/4, metronome marking of 110, a Grand Piano selected, and a score title of Score (x).While the Quick Start Options page should cover most of the setup needs to modify these defaults, there may well be additional elements or changes you wish to make. From your open score page, you can set up or change the time and key signature, tempo, and add measure numbers needed for the score. From this popup Score window, you will be able to write in your Title, Subtitle, Composer, and other text fields available in the menu. Proceed to complete the Key Signature and Time Signature. Note the other choices in the Score menu. You can select Concert pitch note entry (and playback), modify Score layout, open the QWERTY Shortcut list, navigate directly to the app preferences page (under Home Sreen > Settings > Symphony Pro) containing more options, among other score configuration settings. Choose the instrument you want from the list of available instruments. After you have chosen an instrument, a popup dialogue box may ask for transposition or placement in the score. You will be returned to the Instruments window to add more instruments, change, or alter the position of your currently chosen set. You will also be able to create a template of your instrumental setup by selecting the export ( ). To change instruments already created for your score, including the default Grand Piano, follow the Add Instruments pathway above, and select the instrument you wish to change. the Change Instrument dialogue will now allow you to select the instrument you want. Select the Back button, and you will be brought back to the Instruments window to make any other additions or changes. To delete instruments, follow the pathway described above. Select Edit from the right hand side of the Instruments dialog box. A small circle will appear next to each instrument in your list. Check the circle on the unwanted instrument, and click on the trash icon. Note that you must have at least one instrument in the Instruments list at all times. The first default grand piano staff/staves cannot be discarded until an additional instrument or instruments have been created. There are several ways to add notes in Symphony Pro: Use the method that best suits your own way of working, and is most productive for the kind of work you wish to accomplish. Symphony Pro has a particular advantage in its first release: all of the features that we have constructed in past releases can continue to be relied on to help speed your work, now including use of the Apple Pencil and the iPad Pro. Use the best tool for your work at hand. Most input and editing controls are easy to find, but a few involving external control may take a moment to find and set up. Write Mode is engaged using the left-hand icon in the Notes Toolbar. If you see an arrow first, touch and slide the button up, and the pencil icon with pop up above it. Release your finger on the pencil icon. All symbols with small arrows above them work in a similar manner. The Note Entry button must be selected for every input mode or device with the exception of editing while in Notewriting Mode (with the Apple Pencil or Touch). See [Tips and Tactics for the Apple Pencil] below. This button places the current score into construction mode, where we can place notes, articulations, and expressions, along with other musical elements for our project. When the Construction mode is selected, any or all input modes described below can be active, including the use of finger touch, an older iPad writing stylus (capacitive), the Apple Pencil for the iPad Pro, screen keyboard, screen guitar, and external MIDI devices. With the left-hand pencil icon in the Notes Toolbar selected, the Write Mode will be available for touch and/or a capacitive stylus on all iPads. In this mode all note input actions are engaged, including addition of expressions, dynamics, instrumental techniques, text, and the favorites bar. At any time, the zoom feature can be used to expand your score to the size necessary to place a note in the right position. FMI [Main Manual > Add Notes] for more information on adding notes without an on-screen instrument. A capacitive stylus for older iPads will function similarly to finger touch in this mode. Touch and select the piano button, and the on-screen piano will appear at the bottom of the screen. This is often the most efficient way to enter notes, even for those with limited keyboard or guitar ability. Keyboard players: remember that you can expand or contract the on-screen piano size to obtain an optimal size for your personal on-screen needs. Touch the small dots on either the left or right side of the center-key shift bar to expand or contract your key size on screen. The on-screen guitar and bass work in a very similar fashion to the piano, but with strings and frets available for note entry. Also in the Instruments Expandable Button, you will find an external MIDI instrument connection selection as well. To access a wired MIDI keyboard, connect your external keyboard via the Apple Lightening to USB camera adaptor. After you have connected your MIDI keyboard, select the MIDI Input from the Keyboard Menu. Enter notes into the score by selecting the staff and measure in which you wish to begin adding notes, choosing a note duration from the Notes Toolbar, and touching the note or notes on your keyboard you wish to have entered into the score. With the On-Screen Piano, Rests can be added automatically by choosing the equivalent rest value, selectable by the small arrow found above each symbol. The QWERTY keyboard connection is one of Symphony Pro's hidden gems for music construction. Created to enable those who cannot work with the intracacies of an iPad screen, there is an extensive set of note and function commands available directly from a connected (Bluetooth or the Lightening input) QWERTY keyboard. You can learn the default commands (carefully developed with our users who need and use accessibility tools, or you can replace any or all of the QWERTY key defaults with your own choices for each of the supplied commands and tools. FMI: Go to the QWERTY Key Defaults list to find the normally operational commands available on the external keyboard. FMI: To change the default commands, go to [Reassign key commands] in the Help Manual. Remember to make your own list when you change the default commands. To access the QWERTY keyboard, connect your external keyboard via either bluetooth or through the Lightening to USB camera adaptor to a wired keyboard. MusicXML and MIDI import/export, are powerful file protocols for importing work from previous sessions, or from other applications that support these file formats. Most serious music notation applications available for PC and Mac desktop or laptop computers allow the user to save work in the MusicXMLformat. Once saved in this common file format, a MusicXML file can be imported into any other application that has enabled importation of this file format. Symphony Pro can both import and export files in MusicXML. In a similar fashion, we can save, import, and export our work in a MIDI format. However, the MIDI protocols were created almost 40 years ago to allow hardware synthesizers to talk to each other in rather simple ways. While there have been many revisions to the MIDI protocol over the years, MIDI remains a simplified set of music designations, and does not contain many of the important elements that we include in a full musical score. When you save or transfer your work using a MIDI file format, you will lose articulation, expression, and specific graphic indications that often make up the heart of our music. On the other hand, we can transfer solid musical basics via a MIDI file to sequencer and recording applications where the human instructions for musical interpretation are not involved, and we want to combine our notation work for playback with sophisticated instrument files, and with other live and sampled tracks. – Symphony Pro will let you work with as many of these note construction methods as you are able to connect or engage. But beware! Those of us who test each and every feature of an application can attest to the fact that both intelligent users and intelligent applications can be easily confused by too much information, and too many possibilities. Use the best combination of tools for your work at hand. For those of us who are creating a new song or composition, the process of creating music involves a great deal of revision and testing before we settle on a completed passage or finished product. Do I want that note, that rhythm, or sequence? Is this the correct harmony? And, for those of us used to writing with a pencil on paper (yes, there are still some of us around), this handwriting on a glassy screen involves a fair number of "Oops" issues where the Apple Pencil makes marks far too easily. Now we have to get rid of them. Changes, mistakes, development, alteration--these are all part of the process, and while we all would like the compositional process to work in a completely forward motion, it simply does not move in this manner as often as we would like. The same issues are a part of orchestration, arranging, copying a part, and even editing an already constructed work. The trick is being able to fix or modify what needs to be changed, and move on in a seemless way. When you select the Edit/Select mode ( ) instead of the Note Entry/Write Mode ( ), notes, measures, full staves, and even full systems can be copied, pasted, modified, and enhanced with additional indications. When the Apple Pencil is active, access to editing tools does not depend on being in the Edit/Select mode. Use the Lasso Tool (described above) to bring up an editing tools popup menu. Or, long tap the top of a measure line to bring up a popup menu with measure editing tool access through Edit Bar selection. The Apple Pencil also works as a Touch selector for all other editing functions as well. Symphony Pro Touch (also using the Capacitive Stylus) taps, long presses, and swipes in Edit/Select mode are the standard method for acessing editing functions for both note editing and for larger measure changes and additions. QWERTY keyboard commands can also move the cursor around your project and select a note or passage. – Touch/tap the note, or note within a chord that you wish to edit. The note will turn blue and a popup editing menu will appear above the note with multiple choices for note changes, deletion, and further Region Selections. – Touch and swipe across a series of notes. The notes will turn blue, and a popup editing menu will appear with choices for modifying a series of notes. – Long Press and hold a point near the first note of a series you wish to change. On release, the familiar iPad Selection Box will appear, with left and right handles for dragging to surround a few notes, measure, or entire passage. The Selection Box can extend up or down across contiguous systems on your page as well. Drag and release one of the blue dot handles and the editing tools popup will appear with multiple editing choices. – Tap a beam to activate selection handles for repositioning its length and direction. – Tap the top of any bar line and a popup with spacing features and access to further modifications to the right-hand measure with will available by touching Edit Bar. – If you made a touch, press, or swipe by mistake, simply make a second touch anywhere on the screen to undo your selection. NOTE: many of the popup menus that appear on a touch will take you to either the Note Properties or Measure Dialog windows. You can access an extensive number of modifications from these windows. – With the on-screen piano open, selected chords are displayed in blue. Deleting, adding, and changing notes in a chord is quickly accomplished by tapping on a blue key to delete that note from the score, and tapping on a white key to add a note. – With an external QWERTY keyboard open, note duration values can be designated with the touch of a key, while the Apple pencil or touch is used to place the note (Write Mode without Handwriting mode). The initial implementation of music notation via handwriting on a screen is a major step forward for computer music notation. While there are several apps available on both the PC and Mac platforms, all of them are in their infancy, and all of them point to a new generation of flexibility for music creation. Following the guidelines below will help to maximize your handwriting input. 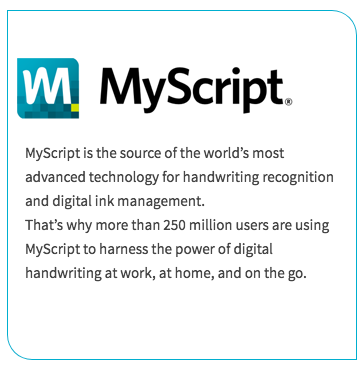 These tips have taken shape during the development of handwriting for Symphony Pro. Use of other applications on various platforms outside of the iPad have also contributed to these suggestions. It is perfectly normal for humans to make marks on a screen that we did not expect nor want to make. We create notes where we don't want them, or decide that those were the wrong notes. In all of these instances, a computer needs to interpret the marks we have made on the screen. Just as writing with a pencil on paper, the eraser is a very handy tool. There are several methods of erasure when the Handwriting Tool is enabled, discussed below. • Sketch notes, chords, and rests into a highlighted measure, including necessary flags, stems, beams, augmentation dots and ties internal to the measure. • Add common articulations and phrase marks right along with your note entry. • Easily add meter changes to the beginning of any measure. • Draw Tuplets over multiple beat groupings, both beamed and unbeamed. Note: the Handwriting Tool cannot yet support dynamic indications, or general text entry. Symphony Pro's Handwriting Feature was designed to use the accuracy of the Apple Pencil on the iPad Pro. The Apple Pencil only works with the two sizes of iPad Pro. To connect the iPad Pencil, plug your Apple Pencil into the Lightening input on the iPad, and pair your pencil. FMI see Write Mode Setup above) are the most common. In Edit/Select Mode, the Apple Pencil will function both for note entry and for editing. The entire Handwriting Mode button can also be deselected: . In this configuration, the Apple Pencil will function in a similar manner to touch (similar to a capacitive stylus). The Handwriting Mode is designed for Apple Pencil and iPad Pro use. However, entering notes and other musical indications via the Handwriting Mode can be accomplished as well on other iPad models and iPad Pros without the Apple Pencil. Long-press the Handwriting Tool button and choose "Use Touch Input" in the pop-up menu. In Handwriting/Touch Mode, all of the handwriting features are active, just as with the Apple Pencil. However, it will most likely be necessary to use Symphony Pro's zoom feature regularly to draw notes and articulations that can be recognized and then converted to print in an accurate fashion. – Select a single staff measure, indicated by a purple dotted highlight box that will surround the measure, and begin to add notes, stems, beams, ties, phrase marks, and articulations. When you are through entering notes and indications for the measure, tap anywhere outside of the highlighted box with either the Apple Pencil or normal tap. Symphony Pro will initiate the handwriting recognition engine, and replace your sketches with finished, printed musical notation. You don't need to wait! You can tap directly into the next measure you wish to sketch and continue note entry. You do not have to complete a measure! Just tap outside of the purple highlighted area whenever you want to see how your handwriting has been recognized. Re-enter any measure to edit it or add material by a simple tap. (Remember that the Apple Pencil cannot yet add dynamic markings, or text). Symphony Pro's recognition software is quite good at recognizing our music handwriting. Create noteheads with a slight diagonal tilt to them, not too thick, more oval than round. Make sure that the center of the slightly slanted notehead is the center of the space or line you want. Always connect your stems to their respective beams when grouping. Crowding notes will not work. If necessary, touch and hold the right-hand measure line of your selected measure. While holding the pencil down, drag your measure to the right. The entire staff will stretch with your move. The extra space created by the stretch should give you some room to continue writing. Measures with many notes may need to have the stretch operation repeated after a beat or two or recognition to continue reassessing the space you need for your measure. – The Lasso feature provides not only a way to delete an unwanted mark, but also activates a popup with deletion, note movement (increment and decrement), enharmonic equivalents, Select Region, and Edit menu buttons. This feature works in both Note Entry and Select modes. Draw a circle around the note or notes that you want to select for modification. The lasso command allows for creating a Note Selection to transpose or edit notes. You can otherwise do the same by dragging a rectangle over the notes with an initial long-press. – Meter and clef changes are available instantly with the Handwriting Tool by simply sketching them in. Time changes must be written in at the beginning of a measure, while clef changes may be written in at any point in a measure. You can hold down your Pencil or finger on a note-head to select a note, after which you can transpose by dragging vertically, or delete/edit other properties from the available context items. 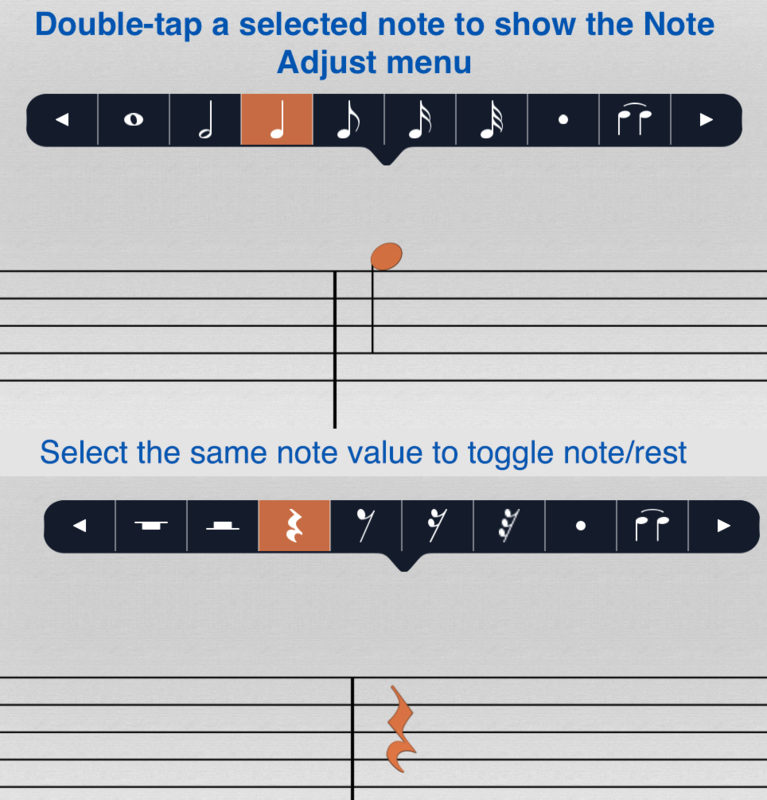 Double-tapping a selected notehead in any mode will show the Note Adjust Menu, allowing quick modification of note value, augmentation dot, and tie properties. – When you have a number of editing operations to make, switch to Select mode while continuing to engage the Handwriting Tool. On occasion, your workflow may go faster with Select on, but with the Handwriting mode deselected. You can continue to use the pencil for its touch capability in Edit/Select mode even when the Handwriting feature is off. – With multiple note input methods available, it is quite possible to have the on-screen piano selected while using the Apple Pencil. In fact, Symphony Pro will allow an external QWERTY keyboard and/or an external music keyboard to be attached as well. o Open the on-screen piano in select mode while continuing to engage the Apple Pencil. The keyboard can select notes that need simple changes like duration, or pitch change, while the Apple Pencil can draw in articulations and phrase marks. The visual feedback of seeing notes on the keyboard, when selected, aids adding and deleting notes significantly easier, particularly with chords. o In Select Mode, touch the chord to be modified. o The keyboard shows the notes that have been placed in the selected chord. Simply deselect the unwanted notes on the keyboard. More changes can be made directly with the Apple Pencil. This method is quite fast, and displays the notes you want to edit in a passage. 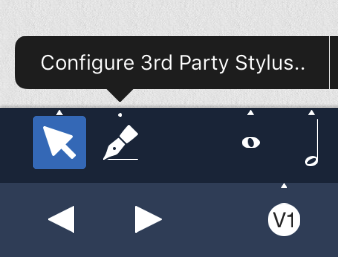 Version 5.2 features annotation support with Apple Pencil, touch, and thirdy-party stylus – provided that you have the Handwriting upgrade enabled. More information along with instructions are available here. – We encourage feedback from our user base to add to the above guidelines, and will endeavor to include important additions as time permits in future releases. Projects can be created and managed in the Projects ( ) menu. The Projects menu box is located in the Navigation popup menu indicated by the large (^) symbol at the right of light grey transport bar towards the bottom of the Score View, or on iPhone, at the top-right corner. From the Project window, an existing score can be opened by simply touching the desired project. The icons across the top of the Score window are described below, plus the addition of a Help icon, Project icon or List view choices, and the Select button which, when touched, enables the selection of one or more projects for renaming, Exporting, file organization, and deletion. Tap on a project to open it up for editing and playback. Tap the Start New Project ( ) button then select New Project to quickly create blank project and begin editing or choose to create one from a template. You can import a file to work on by selecting Copy From iTunes. Tap the Select button, select a project, then tap the Copy button ( ) to create a duplicate file. Tap Select, then tap the Trash ( ) button. In the list view, tap on Select, tap the Minus button of the item you wish to delete, then tap Delete to confirm. Alternatively, you can swipe an item to the left to delete an item. With the project open, open the Scores ( ) menu. Tap on the first field under the Project heading to change the title of the current composition. You can also change the composer by editing the text in the second field. There is no need to save manually because your projects will automatically be saved for you whenever you start a new project, close a project, or close the app. Autosaving can be disabled by Locking a Project. Tap the Select button, choose the project you wish to export, and touch the Export ( )icon on the top left of the menu bar. There are several export options as well as export destinations to choose from. Audio, MIDI, .XML, and graphic formats are all available for Export. • Saving a project to iCloud is currently unsafe when multiple devices share a document, as overwrite warnings are not generated, and Saved work may be lost. • Projects saved to iCloud are not stored locally, and are removed from local storage once the upload is successful. • After launching the app, it may take some time for the list of iCloud-based projects to appear in the Projects Window, but no longer than 30 seconds. If they ever fail to appear, please make sure that you’re logged into iCloud. To check this, go to Home Screen > Settings > iCloud, and verify that the account shown under this section is the one with which you have uploaded documents earlier. • To retain selected Project formats and destinations, Symphony Pro will not export more than one document at a time when attempting to use the Export Menu popup icon ( ). Tagging frequently used or important projects will pin it to the top of the view to make it easier for access. To tag a project, tap Select, select a project, then tap the Favorite ( ) button. You can untag a project by tagging it again. To create a new folder for your projects in the Projects menu, go to the Projects Menu via the Projects icon in the Navigation Menu popup. Tap the Select button inside the Projects Menu Bar, and the Menu Bar will display the Project Features icons. Select at least one Project file, and tap the folder icon (FI) in the Menu Bar. Create a name for your new folder, and select one of the 3 choices presented: Create Folder, Move to Existing Folder, or Cancel if you wish to start over. Add projects to a current project folder by tapping the Select button in the Project Menu Bar, select the projects you wish to add to a folder, and tap the Folder icon. Select the box entitled: Move to Existing Folder to complete the operation. There are two convenient ways to rename a Project. From the Project menu, tap the Select button, select a Project you have created, and touch the Rename icon ( ) in the Project menu bar. Enter the new Project name in the text box, and touch Rename. Projects can also be quickly renamed from inside your Score itself. Once your score has been opened (see above), tap the Navigation Menu button (^), select the Score icon ( ), and the Score window will open to rename your project by touching the current name, and using the cursor to edit the text or replace it. Templates are designed to help you quickly create projects based on pre-selected settings. To start a project from a template, first tap on the Start New Project button ( ) then tap Choose Template to bring up the menu, then select a template from the list to begin editing right away. To delete or rename a template, enter Select mode, select a template, then tap on the Trash ( ) icon to remove a template or the Rename ( ) icon to change it's name. Only user created templates can be edited. Inside the main Score View, bring up the Tracks menu ( ), and tap on the Create Template ( ) button. You will be prompted to create a new template. Once confirmed, a new template will be created based on the project you are currently working on. An Expandable Button is indicated by a small triangle/arrow found above or below an icon or symbol. These arrows indicate that a choice of two or more related options is available for selection. • Example: the Instrument icon ( ) when touched, brings up a toolbar with on-screen Bass, Guitar, or Piano available for note entry. An external MIDI instrument may also be chosen in this submenu. The Notes Toolbar illustration below shows this expandable button along with the toolbar containing the above choices. To choose a submenu option when you see the triangle, tap and hold on the button: perform a slide gesture to the appropriate selection in the popup menu. Expandable Buttons show the most recently activated button: Once you release your finger, the new icon will activate, replacing the previously selected icon. • If you wish to deactivate an Expandable Button, if applicable, as might be the case with accidentals, tap once to deselect. • Expandable Buttons are used throughout Symphony Pro. Remember to reselect an icon (it will highlight in blue) to re-engage the icon’s tool or operation! • In some cases, Long-Pressing an expandable button icon and releasing your finger/stylus will reveal a set of context options for the corresponding tool. An example is shown when performing the gesture on the Handwriting icon (highlighted). From the Project Window, any saved project may be opened with a quick tap on the desired icon. The selected project will load and open in a Score window for additional editing and new work. Score Window Operations are found on the two menu bars at the bottom of this full-screen score window. • The second menu bar is called the Navigation Toolbar. It contains navigation controls, the Undo Icon ( ), Transport controls, and the important Navigation Menu ( ) that, when selected, displays five icon/buttons for opening the menus for editing part Instruments, Score properties, and Playback Options, and also to open Help or to return to the Project Window. The transport controls in the Navigation Toolbar, include arrows for step back and step forward cursor movement, a Transport set including arrows for Return to the Beginning, Play, and a Measure Number Indicator box. Any measure in your entire score may be accessed quickly by showing the Navigation Ruler. Tap the Measure Number Indicator found at the right hand side of the transport bar that shows the current position of your playback cursor. A navigation ruler will appear at the bottom of the screen that allows you to jump to any measure on the score by dragging the playback tracker inside the ruler. The measure you select with the tracker becomes highlighted in light blue, and is marked for the start of playback. Tap on the Measure Number Indicator again to dismiss the tool. Rehearsal marks can be added easily with the Navigation Ruler open. Touch the playback tracker once quickly, and a small menu will appear with two buttons: The left-hand button (Play) will begin playback immediately from the point selected by the tracker. The right hand button, Create Section, will place a rehearsal letter in the score at the current point set by the tracker. Rehearsal marks can be deleted quickly as well. With the Navigation Ruler open, navigate to the Section/Rehearsal letter you wish to delete, and highlight it with a quick touch. Then, touch the playback tracker once quickly, and a small menu bar will appear with two buttons: Play (allowing you to play from the selected Rehearsal Mark), and Remove Section. Touch ‘Remove Section’, and the highlighted Section/Rehearsal letter will disappear. If your deleted Section/Rehearsal letter was in between or in front of any other letters, the following letters will shift alphabetically, to automatically place your rehearsal marks in consecutive order. To enter a Time Signature in your score, open the Score Menu ( ). Select Time Signature/Pickup and a list of common time signatures may be selected. Use the Custom Time Signature bars to create your own (if it is logical!) time signature. A touch outside of this box on your score will set the beginning time signature to what you have selected. To specify a pickup bar for the very first measure, select Time Signature/Pickup, turn on the switch labeled “Pickup Measure for First Bar”, then select “Configure Pickup Measure..” to set the pickup bar properties (i.e. number of beats, note denominator) for the first bar. The scale of the page, which includes measures, chords, and notes, are adjustable. Open the Score Menu ( ) and select Display Settings. In Display Settings, the slider labeled 'Score/Staff' adjusts the default sizes of all score elements proportionally. In the Display Settings window, sliders for Chord Symbols, Lyrics, and Text Boxes allow you to adjust the sizes of the corresponding elements independently from the default page scale. You can choose whether you want to display measure/bar numbers once per every row, every bar, or to disable them. Open the Score Menu ( ), and Display Settings. In this submenu, you will see a section labeled Measure Numbers. Measure numbers may be set on every line or every measure. You may also choose “none” as your default. 3. Print Layout (Default before 4.3): paginates your score as the only WSIWYG option before exporting to PDF or AirPrint. Its output will be very similar to Vertical Scroll, however, the only difference being the lack of page separation using the first option. To switch to a different View Mode, first open the Score Menu ( ), then tap ‘Score View Mode’ to select one of the above options. Vertical Scroll isn’t recommended on iPad 2/3, nor iPad Mini 1/2, due to performance reasons. Furthermore, if you select Vertical Scroll, a score page size in inches must always be specified. This property is permitted to be modified by opening Display Settings > Page Sizes. If your project has one or more transposing instruments, you have the option to place all transposing instruments into Concert Pitch in your score by opening the Score Menu ( ) and turning the Use Concert Pitch switch on. This setting applies to all staves. For easier note entry via On-Screen Piano or MIDI keyboard onto a transposing staff: a new setting is available in 4.2 so that you can enter notes as-played (in concert pitch) without ever having to turn on the above switch. Just look for a separate switch labeled ‘Always Enter Notes in Concert’, available by opening the Instruments Menu, then selecting any transposing part. Scores with many staves, or multiple systems are often difficult to follow in playback, or to see as full pages. You can view and audition your score in full screen mode by tapping a discreet icon ( ) at the top left corner of the screen. The Score window will hide all toolbars and menus, save for a small panel with a Playback arrow ( ) for audition, and a Return button found at the bottom of the Score Window. Vertical brackets to the left of the staff are used to indicate instrument families and organizational groupings. To specify these score elements, go into Select Mode ( ) and tap-and-hold any location on the score for a few seconds. A blue rectangle will appear. First drag the corners of the rectangle vertically to correspond to where you want the brackets or braces to be on the staff. Then select Edit Part/Instrument Groups to view the options that are available to you. You can toggle Part names on/off under Score Menu > Display Settings > Display Part Names. If this switch is turned on, you will then have the option to display part names for every line or keep them to the first line only. Print dimensions may be set to one of several standardized page sizes, or to a custom size. To select a print dimension, go to the Score Menu ( ), touch Display Settings, and then Page Sizes. The Page Size window contains common print sizes, custom size options, and a landscape selection. A choice of any page size will be reflected in what you see on your score page, and on the printed score. Background score colors can be set in your score for comfortable readability. From the Score Menu ( ), Select Display Settings, and then Score Colors. There are 5 background score colors to choose from. As you touch your color selection, the background of your score will subtlely change to your choice. Click out of the Score Colors window to anywhere on your score to return to your Score. Symphony Pro automatically begins on the last screen that was open from your previous session. If you begin on the Projects Menu, select a Project from your choices on screen, or create a new Project. After touching a Project Icon, Symphony Pro takes you to the Score, where you can create and edit your music. There are multiple ways of creating and editing notes: Placing notes directly on a staff with the Notes Toolbar and touch, through on-screen instrument windows, with MIDI input via an external instrument, various Edit methods, and Delete. • The Pencil ( ) mode icon for Note & Expression Entry. Use Write mode to enter notes into your staff, and perform fundamental measure modifications. • Select ( ) mode icon. 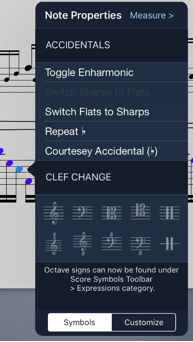 Use this mode to modify the properties of highlighted notes & chords by tapping them or dragging a Note Selection Area. Copy and Paste procedures are also accomplished in this mode. To learn more about how to use Expandable Buttons, read the Expandable Buttons page. To add a note to an existing note or chord, tap above or below it. Hold-and-drag on the added note to move it up or down. Precise insertion makes it easier to append notes to existing chords, or to insert a note at the beginning or middle of a measure. In Write mode, tap and hold on any point within a staff to bring up a crosshair to help you place your note. As you move your finger, the note or chord that would be created if you released your finger at that position is played. The crosshair will be colored blue if it would insert a new note. If it is red, the crosshair is over an existing chord. If you release your finger at this position, the note will be appended to this chord. • Open the on-screen piano ( ). Tap on any note or rest to move the Input Cursor to that location, or simply tap an empty area at the end of a bar to move the cursor to that location. If you’re in Select Mode and the cursor selection isn’t empty, you will see the corresponding piano keys appear in the down (highlighted) position. Play any note(s) on the piano to add to the selected chord. Tap on any of the down piano keys to remove the corresponding note from the selected chord. To add a rest using the piano, select a rest from the toolbar, then play any key on the piano. If the Tie ( ) button is selected, a tie will be added to each note in the selection. The selection will remain on the note/chord that was changed. You can also use the menu to edit the selected note or chord's properties. • Open the on-screen guitar fretboard ( ) in the Instrument icon set. Tap on any chord or rest to select it with the cursor in Select mode. Selecting a guitar chord in either standard or tab notation with the fretboard open will highlight its string and finger positions, which you can edit using the fretboard. In select mode, every time you tap on the fretboard, a note will be added to the existing chord. To stop editing the current chord while in Select mode, tap on the score to the right of the cursor to move the cursor to the next chord or empty spot. Use the left menu to edit the note type of the selected note or chord. – Tap on a piano key or fret position to add a new note. – Tap the delete or undo button to remove notes. Refer to the QWERTY Keyboard chapter for instructions on how to enter notes via external device such as Smart Keyboard. Starting Version 5, Symphony Pro makes it convenient to navigate the score, enter notes, and edit note & bar properties without interacting with the screen. A Note Selection (illustrated) consists of one or more highlighted notes in Select mode ( ), as well as Pencil mode ( ) for working with a single highlighted note. Selected notes show up in blue. Once a Note Selection Area is created, menu items will appear to transpose, beam the notes together, delete, or to convert to a Region Selection for copying and pasting (illustrated). Note Selection Area highlighted in Blue. Not to be confused with a Region Selection. • Once one or more notes have been selected, use the up/down arrows or 8va/8vb toolbar icons above the selection box to transpose the notes by a semitone or an octave, respectively. Alternatively, drag the selection box directly to transpose the notes in half-steps by default. • To toggle note/rest for one or more notes/rests at the same time, first create a note selection and switch the Notes Toolbar to any rest symbol if a note symbol is visible, or to any rest symbol otherwise. • Similarly, activate any of the following Notes Toolbar Expandable Buttons in Select mode ( ) to apply the corresponding property to the selection. Note Adjust Menu items illustrated. The Note Adjust Menu provides quick access to many note editing features with just a few taps. The menu can be accessed from either the Pencil ( ) or the Select Mode ( ) while working in the Score window. First tap the note to be edited. The note will be shown in orange. An initial menu will pop up for stepwise pitch alteration, enharmonic equivalent change, opening the Note Properties menu, and/or deletion of your selection(s). Now tap the box surrounding the note a second time, and the Note Adjust menu will pop up. Arrows on either side of this menu will return you to the previous menu (left arrow), or to more Note Adjust choices (right arrow). • Shorten the note (will add rests to fill the space of the original note), and depending on your modifications, this menu will also allow you to merge or shorten the result of your note adjustment. The multi-voice staff feature allows combining different note values in the same staff (example shown). For instructions on how to use this feature, refer to the Voices/Layers help chapter. In 4.0, rests are automatically padded at the end of a measure you edit, when adding a new note or editing an existing note inside the measure. You can turn off this behavior from the Settings app. Go to Home Screen > Settings > Symphony Pro, then under Usage Preferences, turn off the switch labeled “Auto-Fill Rests”. • The first way to add tuplets is by using Select Mode ( ) to select (highlight) notes. Tap on the Expandable Button for Tuplets ( ) to turn any number of selected notes into a tuplet. You can change the ratio of this tuplet by tapping on this Expandable Button and performing a slide gesture to a different ratio. • In Write mode ( ), you can add tuplets in automatically-formed groups after selecting the tuplets icon. If you want to create a tuplet with a custom fraction, refer to the Special Notes > Custom Tuplets section. In Select mode, you can add accidentals to a selected note with the sharp/flat/natural expandable button in the note entry menu bar. Select the accidental you want from the sliding accidental button, and the selection will be applied immediately. To change the accidental once more while the note remains selected, slide the accidental choices to the new choice. Double accidentals are also available with the use of the slide gesture. To remove an accidental from a selected note, simply deselect the expandable button. Courtesy Accidentals as well as enharmonic modifications are accessed by selecting the desired note to be changed (in Select mode), touching the Edit button in the popup menu, and selecting Courtesy Accidental in the Note Properties choices (illustrated below). Parentheses will be placed around the selected note. Choose the above menu item to toggle a selected note enharmonic in either editing mode. To undo an edit or operation, tap the Undo ( ) button. To redo an edit, tap the Undo icon again, but hold it a bit longer. The Redo button will popup, and may be tapped once or several times to redo your previous editing operations. Tap outside of the Redo button to return to score construction. On both the piano and fretboard, there is a semi-transparent scrollbar that allows you to play at a higher or lower octave, by touching the center of the bar, and moving your finger left or right to the desired octave. With the piano, this scrollbar can also resize the piano keys. You can play one of the on-screen instruments without editing the score. To do this, deselect the currently selected mode (Select or Pencil) in the Notes Toolbar and play the instrument as normal. If the instrument is not showing, open it by selecting the Piano or Fretboard icon. To make best use of the instrument, turn off Multitasking Gestures in the Settings app. This will allow you to play with four fingers without triggering a gesture. • To open the Edit Notes menu, first create a note selection Select Mode ( ), or long-press on a note-head in either mode; then choose the Edit menu item (as illustrated). Alternatively, press Control-N if a QWERTY keyboard is connected.